It's hot, hot, hot here in Colorado this week. Don't you just love that colorful border at the bottom? 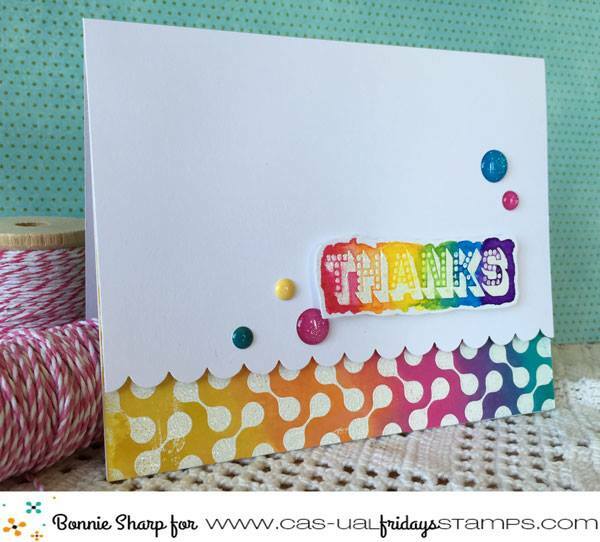 She embossed Curtis Background in white and added color. It's a big background stamp so you could stamp a whole panel and then cut it into pieces and make a whole set of these cards! She used the same embossing technique with our Thanks set for the sentiment. Ok, it's time to set your timers! Our 2016 Holiday release is coming!! Release week starts on Sunday! Wahooo!!! Beautiful card, excited for holiday release! Gorgeous colors! The Curtis Background looks awesome!